All Other States: min. order: 6 Bottles. 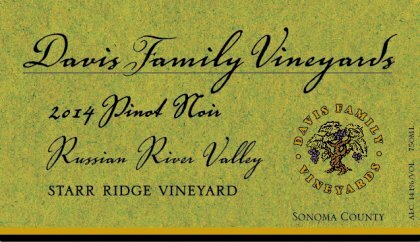 At Davis Family Vineyards, we believe wine is an essential element in a rich and passionate life. In our quest for palatal perfection, our goal is for every wine to be a true, natural reflection of the vineyard from which it came, as well as the vintage in which it was grown. At Davis Family Vineyards we strive to highlight the unique characteristics that make fruit from each vineyard, from each varied mico-climate, so very special and unique. All of our Pinot Noir is aged in French oak for 10 months. 1/3 of the barrels are new, 1/3 are one year old, and 1/3 are 2 year old. In doing so, we are able to benefit from the finesse and structure of barrel aging, while not overwhelming the varietal characteristics of Pinot Noir. The fermentation was conducted using native yeast in small, temperature controlled, open top fermentors. Gentle punch downs were done over a 3-4 week fermentation, after a 5-7 day cold soak. The Pinot is then pressed and transferred directly into barrel, using gravity flow.